Awesome! 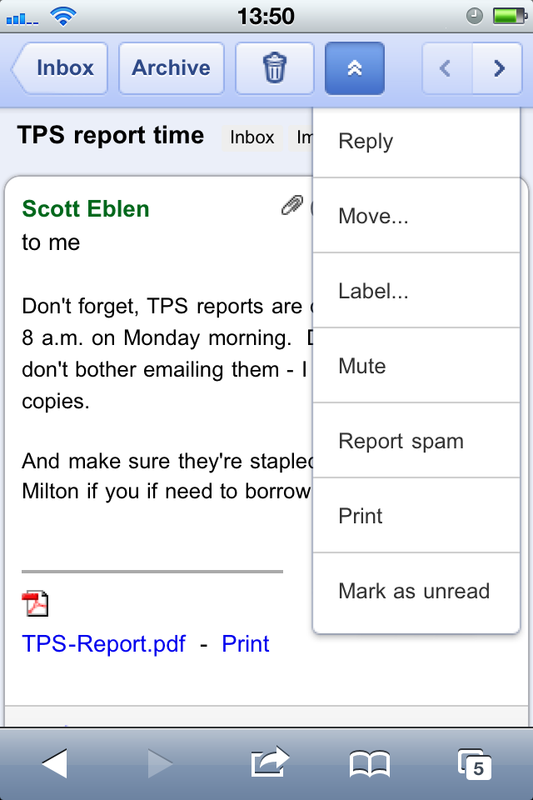 Can't wait till the integration with native Android Gmail app! Printing through the cloud is great, for everything else including direct printing over Wi-Fi and Bluetooth, use PrinterShare. will it work with android 2.1 ?? "a service that in Beta allows printing from any app on any device, OS or browser"
"Just open a document in Google Docs or an email in Gmail"
Yes, it works with my iPhone now when using gmail in safari. Are there other ways to use it on a phone? I can't share my printers - in the printer manager window all I can do is "delete" them... anyone else having that problem? Switching back to Firefox, looking for a new mail portal. I am sick and tired of having to wait a year or two to have the linux version made available. The hot new apps are released to Windows and Android. This removes any incentive to migrate to Linux. And it happens constantly. Google is supposed to be Linux based but the apps are always done in windows because of market potential -- wait they don't sell these - they just control the Linux market with them. Ready for the linux version. Works perfect on HTC EVO, Chrome 9.0.597.67 beta, Dell Color Laser 2130cn. Even in duplex mode! We are working on allowing users to share their printers with other Google accounts. Please stay tuned. Nobody has seen the Office Space reference? *sighs* I want a Chrome Stealthbook damn it!! I would test the heck out of that thing. Are there any plans to allow Blackberry 6 devices to use the HTML5 interfaces? Now that they use a webkit browser it seems like it would have been switched sometime after it was released in Sept(or so). Worked great for me. Very Happy, will be so useful for work, especially if I'm in a trial. Works okay in the UK (hey, that rhymes!). Works with iPhone 4. Set up printer using Chrome on a Mac running Parallels. This is going to skyrocket the paper price. Google, had you adquired any paper factory lately? when will Mac be supported? Please soon develop a firefox add on, or something, or just a standalone printer program that does it. I mean, chrome is okay, but I prefer firefox, no offense. Wow Amazing just printed a PDF from my Evo, My wife was near the computer, and suddenly the Printer starts printing.. I was in my bed laughing she didn't know what the hell happened, I told her two words Google Cloud..
Office Space, I know, huh? Way too geeky here for me. Have to have humor. Yayzers! I was just thinking about this the other day. Can't wait for the Linux version. Just switched to Linux Ubuntu 10.10 and will probably stick to it since it is much more responsive, stable and pretty easy to manage. And since more and more of my work and data are web-based and don't need Windows massive overhead. I appreciate your idea of google cloud print. I strongly feel lot of paper will be wasted, atleast milions of people will try the new app and that means million papers are wasted. Why google is turning out to be a non eco friendly company. Please develop some green cloud print like same paper can be erased and printed again. I hope Google can do this, as it very innovative. I would expect Google to post screen shots from Android phone not iPhone. It's a very clever idea but I'm not sure of its utility. So I'm at work or on the road and I decide to print a couple of pagers on my home printer. I do so and they are printed out when I get home. Of course my PC and printer both have to be left switched an and connected to the net at home - which I wouldn't normally do unless I'd left something running. But anyway, I get home and there are my couple of pages waiting for me. But how much time have I saved? As everything is already switched on there is no boot time benefit so I've only saved the time to sit down at the PC, find the doc, press print and print it. Total time saved? A minute? Two minutes? As I said it's a cool demonstration of the cloud and technology - but I'm not sure how much it does for me. Can't wait to try it on my android phone. 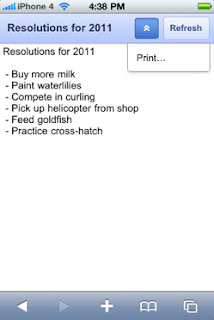 I have just tried, it works flawlessly (from mobile to print). I wonder it could print it from other google service, such as Documents etc... THAT WOULD BE AWESOME! ok i got it to work on my pc but dont know how to get it to work on apple iphone if ne could help me thanks. No explicit mention of Blackberry support.... this has me worried. You have a mobile operating system called Android. Stop using iOS for screenshots and mobile demonstrations. It's embarrassing. Hot launch applications on Windows and Android. This eliminates any incentive to move to Linux. And it happens constantly. Google is supposed to be based on Linux but applications are always on the windows because of the potential market - are not expected to sell these - they just control the Linux market with them. Shocked at the few number of people noticed the Office Space reference.. Someone make sure they get a copy of the memo.. cause we're using the new cover sheets now..
Can anybody tell me, could i use my tattoo with android 1.6 for printing with cloudprint ??? It screwed up my printer, Kodak esp 7250, with win 7 on my lap top, my printer would not work at all, had to restore my computer to yesterday for it to wk. The worst part it was impossible to try and get help from Google, very disappointing. Hopefully better out of beta. When is this rolling out to Australian Android phones? I am using HTC Desire running 2.2.
it works perfectly with my normail gmail account but it DOESN"T WORK with my google apps premier account. Any help? 1. Will this work outside the US? 2. Will this work from a mobile phone using Symbian OS? 2. The Google Talk service is enabled for that domain and for the account. - Google Cloud Print Developer. My printer is connected and printed out the Google Cloud test page, but my Nexus One does not have "print" on the drop-down menu on GMail. How do I make this work? Electa, just to clarify, the dropdown shows up in Gmail in the browser on your phone, not in the native Android Gmail app. Also, the feature is being rolled out to US users and it may take a few days before all users see it. 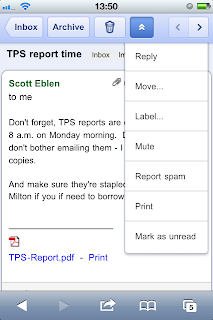 I don't seem to see the drop down button in GoogleDocs. I do see the drop down in my email. Did I need to activate something else? When I open up Gmail in any of three browsers (stock, Dolphin Browswer and Opera) on my Droid, I do not see anything like the iOS screenshots. In otherwords, I don't even have a dropdown option. I only see links at the bottom of the page to reply, forward, etc. No printing option is to be seen. Am I doing something wrong? Alright, so lemme get this straight: as of early Feb. 2011 Google Cloud Print only works (1) from mobile web-based Gmail (i.e. no Gmail app or desktop Chrome browser) and only if (2) Chrome has been started on the proxy computer? Is that so?